Thursday October 30th 1924 I finished packing and Ott took me to The Station. Train to Chicago rather crowded. I talked to The McCalls. Warner had been to The Station to meet me and missed me. I got supper and left for Delavan at eight oclock. At Bloomington the train had to detour so I went to The Arlington for the rest of the night and phoned the Delavan folks. 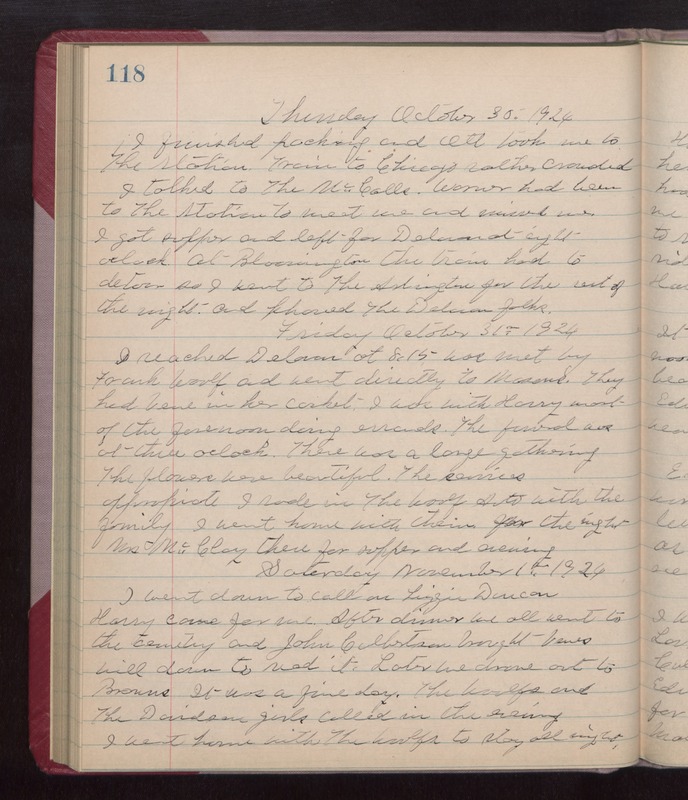 Friday October 31st 1924 I reached Delavan at 8.15. Was met by Frank Woolf and went directly to Masons. They had Vene in her casket. I was with Harry most of the forenoon doing errands. The funeral was at three oclock. There was a large gathering. The flowers were beautiful. The services appropriate. I rode in The Woolf Auto with the family. I went home with them for the night. Mrs McClay there for supper and evening. Saturday November 1st 1924 I went down to call on Lizzie Duncan. Harry came for me. After dinner we all went to the cemetery and John Culbertson brought Venes Will down to read it. Later we drove out to Browns. It was a fine day. The Woolfs and the Davidson girls called in the evening. I went home with The Woolfs to stay all night.